Improve the connectivity and reduce fragmentation through: Hedgerow restoration and planting, along with sympathetic ditch management.. Woodland/scrub restoration and creation, with priority being given to designated and ancient sites, as well as those woodland supporting CSS targeted and BAP species. Creation and the appropriate management of a grass and flower margin network for pollinators, targeted farmland birds and other wildlife. To improve the quality of the pond network and connectivity within the farmed landscape, with particular emphasis of great crested newts, targeted within CSS. Protect, and where appropriate, restore the traditional orchards present within the group area. Where practically possible, increase the longevity of existing mature and veteran trees across the farmed landscape through restoration, and plant a network of new hedgerow trees for future generations. Provide all-year round farmland bird habitat across the landscape for the wide range of farmland bird species present (Lapwing, Grey Partridge, Corn Bunting, Yellow Wagtail, Snipe, Yellowhammer, Turtle Dove and Tree Sparrow) and targeted by the Countryside Stewardship Scheme. 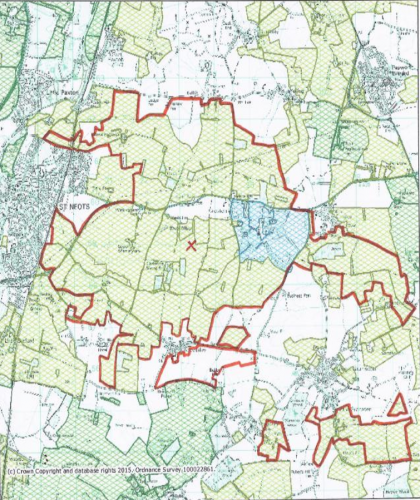 Work in partnership with Catchment Sensitive Farming and the Environment Agency to reduce soil erosion, run-off, nutrient levels and sedimentation issues within the Hen, Abbotsley and Gallows Brook catchment. To develop opportunities for educational access and rural tourism within the local area, enabling farm businesses to diversify where desirable and utilise redundant farm buildings.